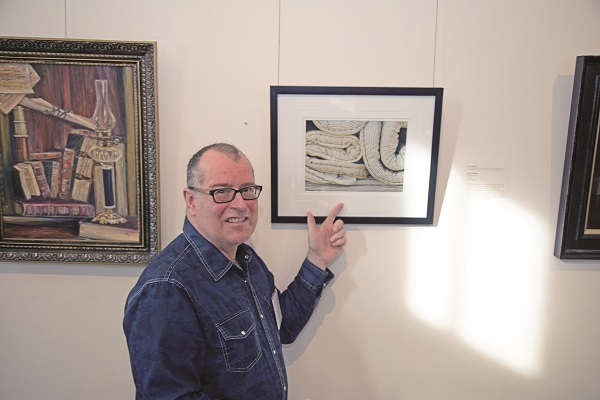 Memories are sometimes fleeting, but York Region artists have immortalized their own in “From Memory”, the new juried exhibition of the Society of York Region Artists, which is now on at the Aurora Cultural Centre through Saturday. The exhibition, which opened January 3, held its formal reception last week and it was there that the jury announced their verdict, honouring their three top prize winners for this year's efforts. “It is amazing how many artists who are a part of SOYRA and have been for some time who have never quite got up to a prize winning location, some have been on the periphery and you can see their work improving all the time, and I am so thrilled to announce Kevin McBean,” said SOYRA President Linda Welch, handing out awards on behalf of the Society and juror Anik Glaude of Unionville's Varley Art Gallery. While SOYRA members are certainly not strangers to juried art shows and sales, this year's show was a little bit different from the rest. Each member was challenged with producing work that fit in with a specific theme. This year's theme, chosen by Aurora Cultural Centre curator Stephanie Nicolo is “From Memory,” a theme which got the creative juices flowing and sparked some artistic trepidation in almost equal measure. SOYRA artists muscled through the trepidation, and 61 works by 38 artists filled every inch of gallery space by the time 2019 rolled around. “This exhibition is to explore how tradition, stories and culture are formed from memories,” said Ms. Nicolo at the opening reception. “The artists selected for this presentation were to respond to that theme. All responses are included on the walls beside each piece of artwork. Our memories are a private collection of stored information, sensations and feelings, created from communal stories and fleeting moments. They nurture our traditions, inform our daily functions, and provide context for our lives. Memories establish where we have been, who we are, and guide us to who we may become. Intensely personal and powerful, memories can trigger a broad range of responses, and that is very evident amongst the galleries today. “Memories come to life [inside a biological system which] is an umbrella of brain structures controlling emotion and driving our learning processes. Without it, we wouldn't have the artwork or the responses to it. Memory is integral to us as humans, allowing us to learn, create, store and retrieve crucial information to just be. It is a major element of what makes us human and how simple and yet complex that story is to tell and celebrate through art. From Memory closes this Saturday, January 26. Excerpt: Memories are sometimes fleeting, but York Region artists have immortalized their own in “From Memory”, the new juried exhibition of the Society of York Region Artists, which is now on at the Aurora Cultural Centre through Saturday.